I had no motivation, but I continued to walk toward the end of the cliff anyway. Three feet from the edge, I tried to stop walking; nevertheless, my legs mechanically stepped forward. The panoramic view of the canyon turned into a frenzy of manic colors; I was falling to my death thinking, “I do not want to die this way.” Suddenly, I sat up in my bed, encapsulated in perspiration and with my bedding tossed violently to the floor. The bizarre event was only a dream; it was only a dream. In Fyodor Dostoyevsky’s Crime and Punishment, Rodión Románovitch Raskólnikov, a poor university student who developed a theory of the extraordinary man (a superior human defying common law for his purpose), has several violent dreams which eventually define his soul. So begins the introduction to my essay entitled “He Had a Dream” (a title my high school teacher, Mrs. Walenberg, noted as “nice & quite ironic”) for a class assignment on a book. The book. By Dostoyevsky. Homework was always a chore. I loved reading and writing as a kid, but, like so much else, I preferred it on my own terms. I read what I wanted and when I wanted to do so. Best of all, I was not forced to write my thoughts. That took work, keeping me away from the next Stephen King or V.C. Andrews novel. 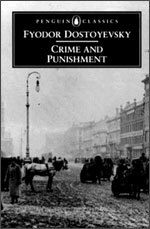 Do not get the impression that I had not read “serious” literature before reading Crime and Punishment. I had. I was in high school, where the classics got jammed down our throats all the time. Nor do I hope to suggest that the other books were not good. It is just that, upon reading Dostoyevsky’s novel, I knew for the first time that I was reading something extraordinary, a book of philosophical ideas—as if I even understood what the hell a philosophical idea meant. At that age, we all have a lot of learning to do. I still see the kid with a black pen in his hand, sitting at the kitchen table in early spring, writing the very essay pages that I have before me today. For reference. For my writing. Gone now is the pen. The surroundings are completely different. I am in my own living room. With a laptop. In a different city. Los Angeles. Really, there are too many changes to catalogue, but the excitement stirred still feels as fresh as the April morning that began in a dream. Evidence of growth, passions and voracious hungers are plain as the text before you now. In your presence are the impressions of one book and the possibilities of its power to awake. My adulation is public, but I continue to hold onto the original pages of my complete essay for safekeeping. Maybe I was drawn to the story of Crime and Punishment because I was a horror fan. At the center of the book is an ax and a grizzly murder, after all. But life is not so simple, nor may our motivations and interests be summed up in such a facile manner, especially when there is something deeper—something more philosophical—at play. For what it is worth, I received an “A” on the essay. The validation provided the perfect amount of encouragement for a student to extend past his existence as a passive audience forever. Moreover, I learned that thoughts and words of my own could live off the page. Whatever the final result, the total experience was enough to get me over the chore of writing about novels or at least writing about Crime and Punishment. Without such a remarkable source, this page and others would be blank.